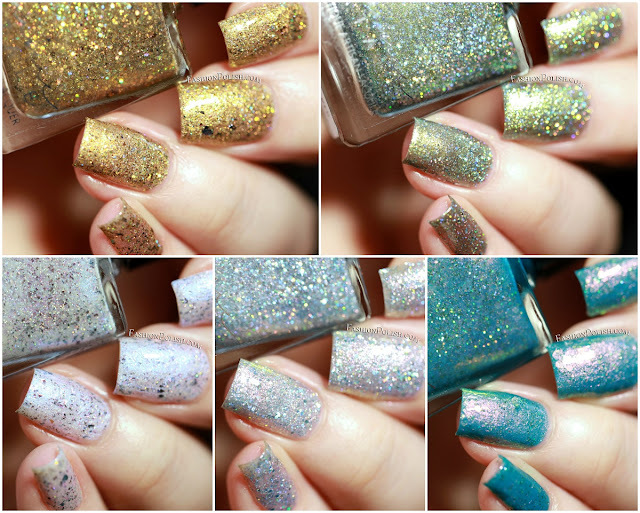 Fashion Polish: Femme Fatale Cosmetics The Little Mermaid Collection Swatches & Review! Femme Fatale Cosmetics The Little Mermaid Collection Swatches & Review! I have swatches of the new Femme Fatale collection to share with you today! The Little Mermaid collection is a set of 9 sophisticated glitters inspired by the namesake Hans Christian Anderson fairy tale. I received a selection of 5 shades so let's give them a closer look. An Immortal Soul is a deep antique gold with a heavy mix of matching shimmers, gold holo glitters and microglitters as well as copper multichrome flakies. I used 2 coats plus topcoat. Built with Shipwrecked Bones is a deep green shimmer filled with silver holo glitters and green to gold shifting shimmers. I also used 2 coats plus topcoat. The Fallen Statue is a pearly blue with a mix of silver holo microglitters and pink multichrome flakies. I used 2 coats in my swatches but this one's a 2 to 3 coater. Among Daughters of Air is a silver glitter bomb that consist of pink to gold color-shifting shimmers as well as different sizes of silver and silver holo glitters. I used 2 good coats plus topcoat. Dominion of the Sea Witch is a medium teal with pink to gold color-shifting shimmers and a mix of different sizes of hex glitters in holo to multichrome. I also used 2 coats plus topcoat. The Femme Fatale Cosmetics The Little Mermaid Collection will be available for pre-order from Wednesday, February 1st to Sunday, February 5th on FemmeFataleCosmetics.com.au and FemmeFataleCosmetics.us (new! ).